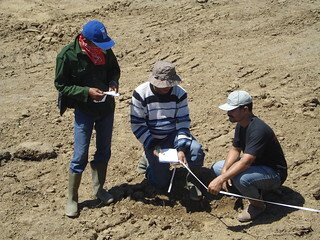 UNDP field staff help the community measure land after clearance to determine boundaries. Through the MDF- TRWMP, UNDP is working on the clearance of 3,000 hectares of paddy fields from deposit of debris and sediment brought by the tsunami in Aceh. This program helps community livelihoods in the agriculture sector.